Spectacle is the ability to prioritize the technical and aesthetic properties of a medium over the conceptual exploration of a medium. Speculation is the ability to prioritize conceptual exploration of a medium over the technical and aesthetic properties of a medium. Universal Everything's Walking City (2014) is mostly spectacle. 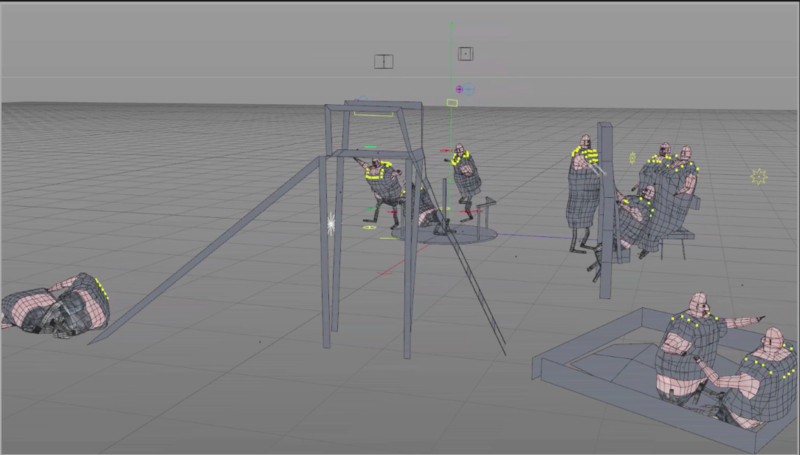 The piece explores the methods of animating the walking motion and the transitions between the methods. The character's motion is constant and continuous. The character does not exhibit any emotion and is walking toward nothing. The background is blank. The purpose is to show the animation skill, not display a meaning. The piece leans toward acceleration, is it shows off a new technical boundary of animation. The piece is very visible, as it very clearly shows what it is demonstrating. It is surplus, as it is useful for future work but useless from a conceptual standpoint. It was created commercially as a technical demonstration of the studio's ability. It shows only function. Spectacle is most easily recognized in works that milk the most out of current technology--it's usually flashy, engaging, easy to understand, for capital gain. Speculation pushes the edge of understanding + technology--it is not self conscious, can also be flashy, but also confusing, uncomfortable, in the midst of coming to terms with itself. AES+F is an art collective that plays a lot of faux realistic 3D through 3D modeling and photo manipulation. This particular piece, Trimalchio, was made in 2010. It's hard to categorize this as either speculation or spectacle because I think it's so much both (maybe it does reclaim spectacle into speculation). At first glance, the aesthetic is very beautiful, with many references to renaissance/greek god type imagery. But as you watch the videos, the references to all kinds of humanity + culture come out of nowhere, seamlessly blending into this utopic world. I think AES+F uses 3D in an interesting way because it's not the tip top frontier of 3D imaging, yet the blend of photo+manipulation makes it look extremely real. It's the photography that brings it out of uncanny valley, and the very intentional play with scale, imagery, and context that bring it into the weird, which I think is awesome. Spectacle can be defined as the category containing computational art created by commercial studios and highly funded collectives that focuses on being impressive through scale, detail, or polish. Speculation can be defined as the computational art, often academic, that yields more freedom to speak critically about society, while usually relying on technicians hired by the artist to handle the technical aspects of the project. Theo Jansen's Strandbeests, while not fitting totally cleanly into one category or another, definitely align more closely with spectacle. They are an evolved and evolving species of physical sculpture whose evolution (at least that of the mechanical leg components, as the evolution is a mix of computer generation and educated human choices) is driven by an evolutionary algorithm working towards an ideal walk pattern. The project carries little to no social message, and is rather an exploration in the creation of mechanical life forms. Many of the creatures exist on a massive scale. They are incredibly, sometimes twice or three times the height of a human, and their massive sales wave in the wind. They arrest attention as they walk down beaches (their primary habitat). 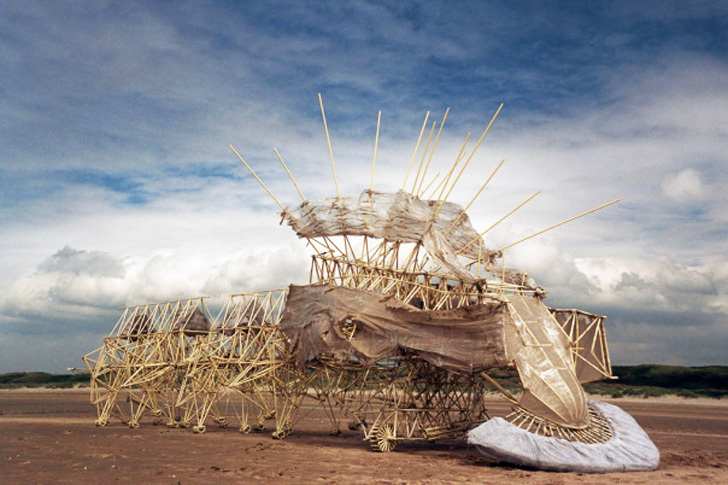 By the dichotomies presented in Warburton's video, Strandbeests clearly fall more into the category of spectacle. The sculptures' evolution and release seems to indicate a sense of acceleration rather than dragging. While many of the changes may be small, there are moments of major leaps forward in the sculptures' technology. The pieces are massively visible: they are released in public spaces (beaches), move, are mesmerizing to look at, and they are very large objects. They seem to exist in a surplus: there are a lot of these sculptures at various stages of the evolution, many of them move along the same beaches rather than become waste. In a departure from spectacle, though, the sculptures are most certainly art over commerce. They are not designed to be bought and sold, rather they are designed to be observed and appreciated. Finally, they exist somewhere in between function and dysfunction. 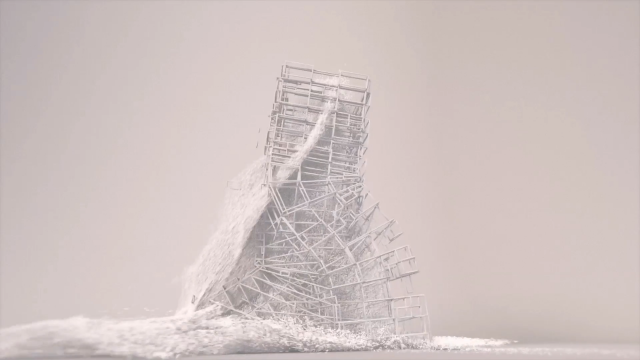 While the sculptures do not serve a necessary function in society, every iteration of the Strandbeest introduces some sort of functional mechanical advantage making it a better survivor than the last: better leg part ratios, more efficient methods for capturing energy from the wind, balance or collision avoidance, etc. Spectacle is characterized as being more passionate about technology than the underlying theory. Speculation, on the other hand, is tends towards criticism and reflection rather than rapid adoption of new technologies. If technology wasn't advancing so fast, the academia would have caught up, keeping a thorough record of things, putting things in perspective, and constructing relevant theories. But currently, the two fields operate at a different pace with contrasting ethos. I think that Akinori Goto's 3D Printed Zoetrope is a good example of spectacle. It takes something that has been around for many years (the zoetrope) and refines it using impressive modern technology. The project is very clean, polished, and precise. Although the project is definitely explorative, it was created by a very controlled and deliberate process, which is outlined in detail in the video. In addition to software, the piece requires lighting and a spinning mechanism to show anything of interest. The project is successful in showing off new and difficult technology, and the idea is very awe-inspiring. The combination of all these things makes this zoetrope fit in with the idea of spectacle. In terms of the dichotomies presented by Warburton, I would say that this project is very visible, as its simple beauty can be enjoyed even without context. I don't see the project as having much waste, since it seems to have been crafted efficiently with a moderation of software. I would also say that this project is more art than commerce, and also more dysfunctional, since it holds little commercial value. Finally, I think that it has more drag than acceleration, since there is not much else to be done with this technology in the future (at least that I can think of). 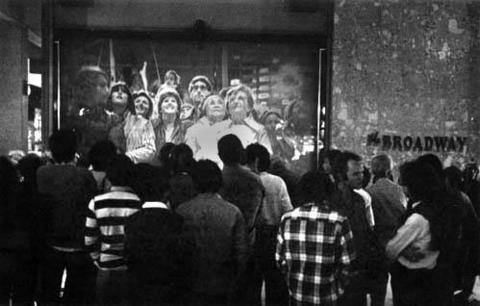 When Wharburton refers to a work as a "spectacle", he implies that the project may be technically astounding and visually interesting but is lacking in content and self-awareness. Conversely, computer art that is "speculation" deals heavily with conceptual and theory-based ideas but may not have strong technical applications. Studio Moniker's "Do Not Touch" (2013) is an example of a "spectacle". Visually, the project is interesting and compelling to look at while the video plays but substance-wise, there's not much to be said about the concept. 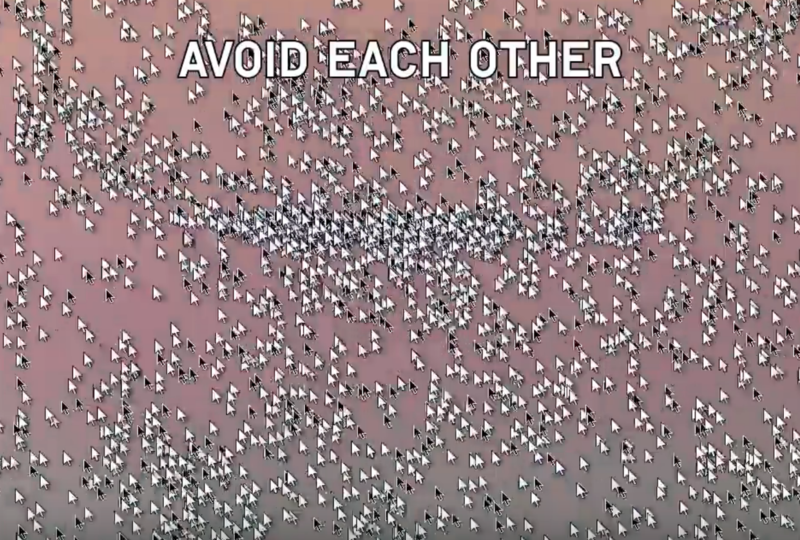 Using the dichotomies from Wharburton's video, "Do Not Touch" leans more towards commerce than art as it is a music video intended to sell copies of the band's albums. Furthermore, it does nothing to increase awareness/visibility of pressing social issues. The only compelling aspect of the project is its "interactivity" with the band's fans. One could argue that the tracking of the users' mice allow us to visualize the obedient and disobedient tendencies of the users. But not much else can be said about the work as a whole. Spectacle is when a medium is used to show off the latest software, often by large companies and in advertising. Speculation focuses not on craft, but on the relationship between technology and art-making, often in a way that is meant not to be visually appealing but conceptually interesting. The project A Hole in Space is one that I think could be argued as both spectacle and speculation, and for that reason I view it as sitting somewhere in the middle. It absolutely has elements of being a spectacle - it is showing off new, grand technology in capturing and broadcasting video in a way that is meant to be technically amazing to the viewer. However, it also has elements of speculation, where it is commenting on growing technology's ability to impart a sense of togetherness and to make the world a little smaller. This is something less about the technically impressive aspect of the project and more about what it is "about" conceptually. This piece falls very strongly towards technological acceleration in acceleration vs drag, as it promotes a future with increased telecommunication capabilities. Clearly it is more about visibility rather than invisibility, particularly in the aspect that viewers cannot see themselves on the screens, as with a typical video-chat, but can only see the other city. I would argue this piece leans more towards surplus rather than waste, as it is more emphasizing the positives of the development of technology. Finally, I think this piece is exclusively in the category of art rather than commerce, as it was done unannounced with no brand, advertisement, or promotion of any kind attached to it. Spectacle is the use of video and mixed digital media as a vessel for existing ideas. Speculation is the investigation of this digital form, exploring the nature of software and exposing facets of digital medium itself in a way that's self-aware. A project I learned about this semester is a YouTube channel called alantutorial. The content on this channel is, above anything else, extremely unsettling. The idea behind the videos is that this bizarre character, alantutorial, is recording a series of random and seemingly pointless tutorials to upload to his channel. These tutorials demonstrate how to do things like making mail into square and how to build a weatherized hole. These aren't things that anyone would need a tutorial for, but that's the idea of the project: a series of tutorials that exhibit not the process of doing something, but the strange behaviors of this deranged character as he tries his best to present an informational video for his fans. This work is definitely more speculative than it is spectacular. It plays off the style of tutorial/DIY videos popular on YouTube in it's earlier days (before 2012 or so). There are a countless number of these no-budget tutorials online which make up their own genre of online video, all following the same vague structure of every other YouTube tutorial. Alantutorial rejects, while simultaneously parodying, the style of production value seen in these tutorials, where they're usually made by some kid in a garage with a 144p camcorder. He even parodies nuances of these videos like struggling to hold something down with one hand while having to hold the camera in the other. This work stands closer to speculation because of what it presents at face value. At their surface, these videos are no different from any other tutorial on YouTube. He introduces his channel and what the tutorials about, he goes through the steps of some process, and finally presents the product of his efforts and signing off. By making the viewer question not only why they're watching the video, but why anyone would want to watch it, it begs the question of where it came from why it exists, which is not often asked of the videos we watch online. The idea that you are watching someone demonstrate how to do something you have no interest in doing is what makes these videos seem to drag on and almost be a waste of time. They're only a few minutes each, but because they're essentially nonsense, the viewer is more skeptical of whether watching it is worth their time. There are many details hidden in these videos that are not addressed directly, but add a layer of surrealism and nuanced cohesion through each video leaning slightly towards the realm of spectacle. You can tell that there was care put into setting all of these videos in the same universe with the same reoccurring imagery and callbacks. It makes for a confusing, unsettling, uninviting, visual spectacle. The places where he films these videos is usually disgusting. 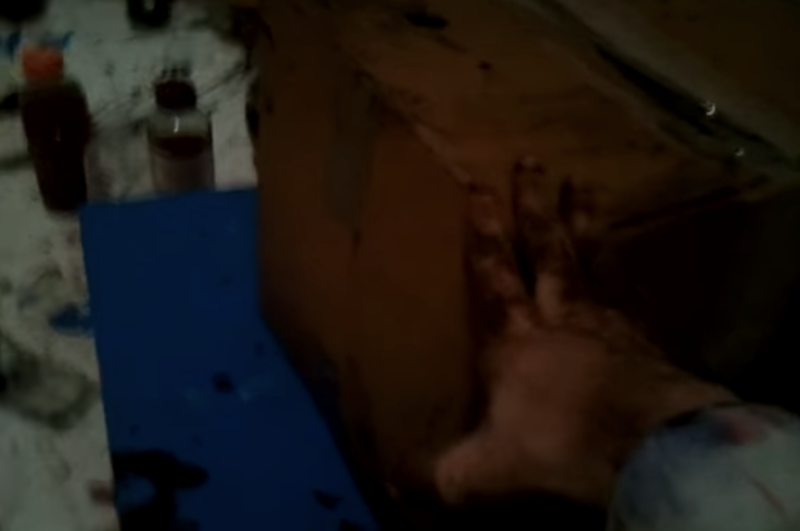 Paint and dirt everywhere, things leaking, things bleeding, dangerous power tools, etc. Most of the time he's pouring stuff on the floor and making a mess, and at the same time there's a sense of neediness and not-having. For example, he makes a video about getting a dollar one day. Watching him operate makes you almost empathize with and worry for him while he mindlessly destroys his things. I would say these videos touch deeper into the art side of experience rather than the commerce side. When taken at face value these videos have very little substance, and most of the time don't even teach the things they claim to. They require a deeper analysis from the context of the YouTube tutorial genre as a whole, and what parts of that formula are being exploited and distorted. Spectacle vs. speculation: A spectacle is something commonly associated with the "higher end" while its purpose is more often than not profit-oriented and less about its own awareness. Speculation is more related to the social engagement that is more ambiguous with its goals, but it is focused on the actual content itself (radicality, relativity, disempowerment, etc.) rather than for an ulterior motive. One of my previous looking outwards project describes the AIBO (or Artificial Intelligence Robot). Although at first, I assumed it would be more related to being a spectacle in its mass production and appeal to the crowd (design and functionality wise), I believe it is, in a way, both a spectacle and speculation. I think it's inherently tied with speculation in that the AIBO soccer matches were started as a way to further AI technology, with groups around the world participating on advancing their own AIBOs to improve and share information with others. 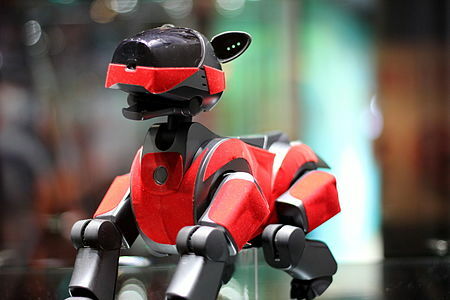 Acceleration: The AIBO are constantly being renewed and improved not just from one company, but by other groups and individuals across the world. Visibility: They are creating events like the soccer tournaments to raise awareness of AI technology. Surplus: Each generation of AIBOs have the potential to be further renovated by others; nothing is "wasted". Commerce: Production of AIBOs were created with its introductory goal being commerce.